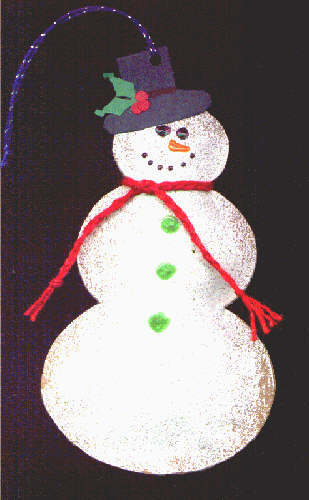 Snowman - Fit-It Frames Demo Program by Red Castle, Inc. These samples were created by using the Fit-It Frames Demo Program, which you can download free. The idea of the program is to give you a chance to actually get the look and feel of how Fit-It Frames works, before you buy. Click on an image for a larger view of the card. Use your browser "back" button to return to this page. Cut two shapes from brown kraft paper and then embossed them in white seafoam embossing powder, it looks wet and shiny. After gluing around the edges of the snowman, stuffed it with a little fiberfill so it would be puffy. The features are done with Tulip paper paint, the hat was cut freeform from cs and the holly is leftover from things I've punched out. The scarf is thick scrap thread braided together. The total size is about 4 1/2 inches. It's really made a cute ornament! All brand names and product names are trademarks, registered trademarks or trade names of their respective holders. (c) Copyright 2000 by Red Castle, Inc. Red Castle, Inc. - P.O. Box 39-8001 - Edina, MN 55439-8001 All Rights Reserved.